BriSCA - Racewall - fun, exhilarating and dangerous! It all started way back in 1954, to be more precise April 16, 1954, when a showman called Digger Pugh from Australia, promoted something we now know as a BriSCA Formula 1 Stock Cars. The roots of this race can be traced back to United Kingdom, London, New Cross Stadium. The explosion of fan base and all-around-mess about it, took its toe by a lightning speed all across the UK and Europe. It didn’t took long until next two meetings occurred at New Cross and Odsal Stadium, back in 1954. At first, vehicles were just a modified, standard, saloon cars with V8 engines, bumpers and roll bars added as feature. Next year, in 1956, the BriSCA association was formed due to the high popularity and fan base. Year after that, in 1957, the association of promoters was formed alongside with Stock Car Racing Board of Control. From that day on, the UK explosion was massive. BriSCA itself, along with other terms of races, agreed that only authorized drivers from association itself could participate under their name. In 1975, 30 drivers broke away from BriSCA association and formed something we know as SCOTA (Stock Car Oval Track Association). Later, they changed name to F1SCA (Formula One Stock Car Association), only to change name again to something we now know as ‘Spedeworth V8 Stock Cars’. 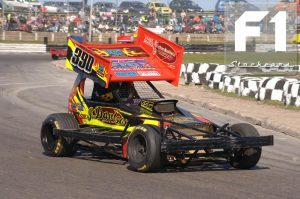 BriSCA is a standard, stock car, single seater car powered by engine of choice (mostly being a standard V8 engine). They have unique features like bumpers and roll cages because of nature of race itself. The race ground is, mostly, custom built oval track with either shale or tarmac and about a quarter-mile in length. Tracks are surrounded by Armco barrier or post and cable fences. Racing itself is very dangerous and exhilarating because it’s a full contact race – meaning that drivers are allowed to push and bump into each other’s. With that in mind, cars are custom made with features for a hard game.